Broken Hill real estate agent Matthew Handberg has been honoured by his colleagues at CENTURY 21 at the global real estate chain's recent Annual Gala 2012 Awards event held in Adelaide. I have met Matthew a few times whilst in Broken Hill and I have found him to be very helpful and informative. He was kind enough to be interviewed and quoted for my 31 October 2012 Broken Hill Real Estate Report post, when he gave me the 'head's up' about the local Broken Hill real estate market. I am not surprised to read about his awards in today's Barrier Daily Truth newspaper (page 12). Matthew was awarded 'Top Regional Principal 2012' and 'Rookie of the Year 2012'. He was inducted into CENTURY 21 Masters Club for high achievers and was also honoured with the prestigious Platinum Sales Award for the 4th Quarter of 2012. 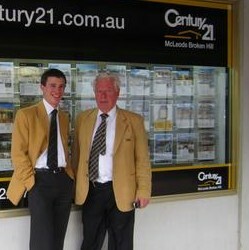 His CENTURY 21 McLeods Broken Hill colleague John Bent was also honoured with a Gold Sales Award for the 4th Quarter 2012. It sounds like the last few months in 2012 in Broken Hill must have seen quite a bit of residential sales activity. I congratulate Matthew and John on their awards, well done.